The Glion has been referred to as the perfect commuter scooter by many customers that already bit the bullet and invested. In essence, it’s a highly portable mini-scooter suitcase ready to help transport you everywhere and anywhere you need. This scooter definitely doesn’t lack features, and it’s a fast, convenient ride all-around. It’s fitted with a Lithium-Ion battery, has an incredibly fast charge time, has a chainless, quiet motor and tires that don’t encourage damage or worrying about getting a flat when you’re on the road. The Glion folds easily and can speed up to 15mph on even surfaces. The design even includes a pedestrian bell! Whether you are hoping to be the coolest kid in school this semester, or if you just want a way to get to work faster without having to pollute the environment – this bad boy of a folding electric bike might be the perfect option for you! It is light-weight yet sturdy enough to take you both down the road in your neighborhood, as well as up and down hills when you are out for a bike adventure in the woods or in the mountains. This hybrid bike gives the best of what an electric bike can offer, combined with that of a regular bike! Get the exercise you need by using it only as a bike or turn on the engine for a bit of extra help up a steep hill or at the end of a long work day. The possibilities are many and perhaps even endless, and thanks to the simple fold- and unfold function – you can store it just about anywhere! This all-terrain electric folding bike is equipped with extra thick 20” x 4.0” tires to keep you rolling no matter the weather and regardless of what surfaces you use it on. They will take you down the pavement on a rainy day, up and down the curb and whatever else you might encounter on your way to work or down to the store. The tires are also perfectly apt to take you safely down a slippery mountain slope or in forest terrain with sticks and twigs covering the ground. The thickness of the tires is what draws many potential buyers to first look at this product, as it offers both stability and a unique style. The 500W gear motor has a strong climbing ability to help you out where your legs might not have it in them to get you up a steep hill, or when you could use a break for that last mile home after what felt like a never-ending day at work. Just turn on the motor and your peddling will instantly become a whole lot easier, bringing you effortlessly to the destination you have in mind. One of the reasons to why many people choose to drive to and from work instead of taking a bike is because they know they will be tired at the end of the day – but this eco-friendly electric bike solves that issue! There is no more room for excuses. The motor is powered by 36V lithium batteries that come in a sealed pack that can be removed for easy charging so that you never have to worry about running out juice at an inconvenient time. The max speed of this beauty is 20 mph, which is more than enough to give you that extra push you might feel you need. Get maximum efficiency and speed with the Shimano external 7-speed gear and keep an eye on the power display on the handlebar to keep track of how fast you are going. The bike has all the features of many much more expensive products, and the strong motor makes sure it goes at just the right speed. More than 20 mph could easily take away from the experience since it might not be possible to peddle fast enough, so this bike has it all figured out by having the capacity to reach a perfect speed for an electric bike. 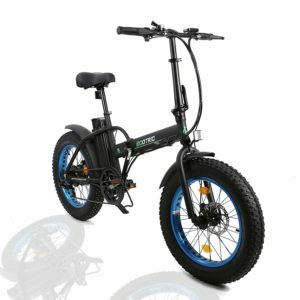 With 6-kilometer constant speed cruise, you are unlikely to be let down by this electric bike with its sturdy aluminum alloy frame, as it is built and designed to take you wherever you need to go with both efficiency and style. The frame folds so that you can easily take the bike with you in the car, on the bus or on the train, or store it at work or basically anywhere before getting back on it. This foldable mountain bike weighs about 50lbs, and the fold- and unfold function is easy to get the hang of so that anyone can use it and enjoy it. It assembles easily as you only have to attach the pedals, the front fender, and tire, the seat and attach the small display device to the handlebar. It can be done within minutes, and the product comes with a practical toolkit to ensure that you have everything you need to get out on your new bike. An electric bike is the perfect option for anyone who is looking to save on gasoline (no gas needed here! ), for someone who might not have a driver’s license, where there isn’t a lot of public transportation, to help the environment or for someone who simply wants to have a whole lot of fun with this mountain bike with a twist. There are no limits as to what it can be used for, and it offers a wide range of practical features which makes it a safe bet when trying to pick a product to purchase. Transportation should be cheap and fun, which is what you get with this electric folding bike. This bike is suitable for anyone who needs an extra boost when getting from one point and to another, and who wants to avoid having to drive or use other gas driven transportation. It works just as well for a person who only needs it to get to places in the city, as for someone who likes more adventurous outings. The seat can be raised enough to fit even taller individuals, and there is no specific weight limit, which indicates that it can handle the same weight as any regular bike would. 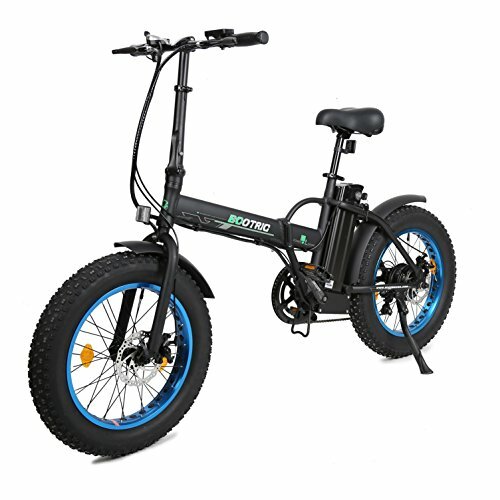 When looking through electric bike customer reviews – several users weighing over 250lbs report using it on flat surfaces without any issues what so ever, which means that this sturdy electric bike is possibly suitable for whoever would and could use a regular bike. Caution should be taken before allowing a child to use the bike, as children might not have the maturity and the sense of responsibility to safely operate an electric bike. 20mph is fast for a bike, especially when you are not used to it, and could potentially endanger a child. While a child may be able to use it under adult supervision, it is recommended to reserve its use for adults and (or responsible teenagers. It is an overall versatile product where the manufacturer has made an effort to make it suitable for a wide range of individuals, regardless of needs and preferences. While great for mountain bike enthusiasts and adventurers, it is also suitable for elderly thanks to its sturdy construction and no-slip thick tires. It is an excellent option for those who might love biking, but who due to age can no longer bike around as they used to on a regular bike. The most attractive feature of this fat tire folding bike is its versatility, and how it has been designed to fit a variety of needs. This makes it possible to purchase one for the entire extended family (though it should be used with caution around kids), so that grandpa can use it for a bike ride around the neighborhood, only to then hand it over to that adventurous aunt who likes to go biking in the mountains. It is perfect to bring in the car for easy transport to any adventurous location and to store at home or somewhere else since it occupies minimal space. We are also impressed with the resilience of this product, and how it can reach up to 20mph and handle steep hills and irregular terrain. The strong motor is what does the trick here, and the fact that it has a 500W motor, which isn’t too common in 20” electric bikes. An electric bike really does not need to go any faster, because as mentioned above – it can be hard to peddle at a higher speed, which ruins or at least takes away from the biking experience. You won’t have that issue with this bike, thanks to a manufacturer that knows what a biker needs and wants, and how to properly provide it without going overboard. The ECOTRIC Fat Tire Folding Electric Bike comes at an affordable price, and you end up getting a lot for the money you pay, both in terms of quality and functions. This bike costs under $900 yet include all the same quality features as some electric bikes that cost almost $3000, which makes it a great deal no matter how you look at it. Products that motivate people to leave their cars at home and to do something that benefits both their health and the environment should get the credit they deserve, and come at a price that people can actually afford. For a folding electric bike – this sleek looking bicycle has it all!